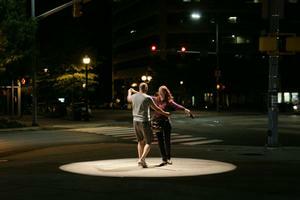 On a normal city street, on a night like any other, a spotlight appears... and the street turns into a stage. Limelight: Saturday Night is a public art installation by Sans façon that replaces two existing street light heads with theatre spotlights, inviting passers-by to seize a moment in the limelight and unleash their inner performers. Sans façon - the duo of French architect Charles Blanc and British artist Tristan Surtees - will be in Calgary for an 18-month residency as part of the Watershed+ project, with the Utilities and Environmental Protection Public Art Plan. Limelight: Saturday Night will appear on Olympic Plaza on Saturday, January 14 as part of the 2012 High Performance Rodeo.